Fluid inclusions in diamond provide otherwise inaccessible information on the origin and nature of carbonaceous fluid(s) in the mantle. Here we evaluate the role of subducted volatiles in diamond formation within the Siberian cratonic lithosphere. Specifically, we focus on the halogen (Cl, Br and I) and noble gas (He, Ne and Ar) geochemistry of fluids trapped within cubic, coated and cloudy fibrous diamonds from the Nyurbinskaya kimberlite, Siberia. 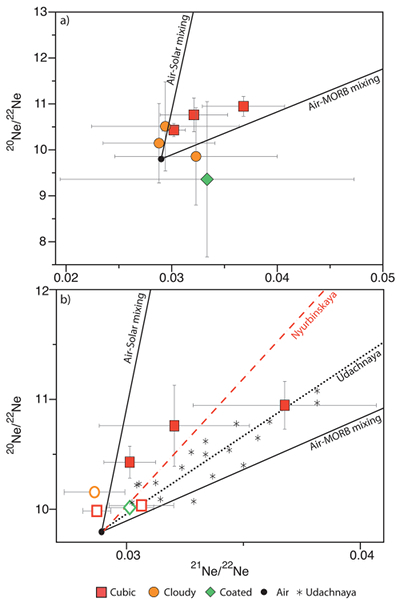 Our data show Br/Cl and I/Cl ratios consistent with involvement of altered oceanic crust, suggesting subduction-derived fluids have infiltrated the Siberian lithosphere. 3He/4He ranging from 2 to 11 RA, indicates the addition of a primordial mantle component to the SCLM. Mantle plumes may therefore act as a trigger to re-mobilise subducted carbon-rich fluids from the sub-continental lithospheric mantle, and we argue this may be an essential process in the formation of fluid-rich diamonds, and kimberlitic magmatism. Figure 1 Log-log plot of I/Cl vs. Br/Cl (mol/mol) for the Nyurbinskaya diamonds. Seawater, average mantle, marine pore fluids, altered oceanic crust fluids (AOC) and Canadian diamonds are shown for reference (Johnson et al., 2000; Muramatsu et al., 2007 and references therein; Kendrick et al., 2012; Chavrit et al., 2016). Nyurbinskaya diamonds range from mantle values towards enriched Br/Cl, similar to AOC and Canadian diamonds suggesting there has been an input of Br-rich fluids to the Siberian lithosphere. Uncertainties are 1σ when shown and are often smaller than symbol size. Figure 3 (a) Neon three-isotope plot for crushing of Nyurbinskaya diamonds. (b) Zoomed in section showing data from laser extraction (open symbols) plus the crushing data from the cubic diamonds. Diamonds show excess in 20Ne/22Ne and 21Ne/22Ne relative to air and plot intermediate between the MORB-Air mixing line and the Solar-Air mixing line. Dashed red line is a regression line fitted through all the Nyurbinskaya diamond data and forced through the atmospheric values. Dashed black line is the trend for Udachnaya olivine xenocrysts (Sumino et al., 2006). Uncertainties are 1σ. Figure 4 Total nitrogen concentrations vs. the percentage of nitrogen in the B aggregated state. Each point is from the analysis of a single diamond, full symbols are from the bulk measurement, whilst open symbols are from the fibrous coat or cloudy interior of the coated and cloudy diamonds respectively. Isotherms are calculated assuming a temperature range between 1200 °C (solid lines) and 1300 °C (dashed lines) as reported for Udachnaya xenolith (Boyd et al., 1997) and assumed residence times between 1 Ma and 200 Ma. All diamonds indicate a residence time of less than 200 Ma at the temperature estimated for the Siberian SCLM at 360Ma (eruption age of Nyurbinskaya and Udachnaya kimberlites). Haggerty, S.E. (1999) A diamond trilogy: superplumes, supercontinents, and supernovae. Science 285, 851-860. Gurney, J.J., Helmstaedt, H.H., Richardson, S.H., Shirey, S.B. (2010) Diamonds through time. Economic Geology 105, 689-712. Navon, O., Hutcheon, I.D., Rossman, G.R., Wasserburg, G.J. (1988) Mantle-derived fluids in diamond micro-inclusions. Nature 335, 784. Nimis, P., Alvaro, M., Nestola, F., Angel, R.J., Marquardt, K., Rustioni, G., Harris., J.W., Marone, F. (2016) First evidence of hydrous silicic fluid films around solid inclusions in gem-quality diamonds. Lithos 260, 384-389. Skuzovatov, S., Zedgenizov, D., Howell, D., Griffin, W.L. (2016) Various growth environments of cloudy diamonds from Malobotuobia kimberlite field (Siberian craton). Lithos 265, 96-107. ). Diamond-hosted fluids therefore represent the only direct samples of mantle fluids, and provide a unique insight into the composition of carbonaceous fluids from the mantle. Klein-BenDavid, O., Logvinova, A.M., Schrauder, M., Spetius, Z.V., Weiss, Y., Hauri, E.H., Kaminsky, F.V., Sobolev, V., Navon, O. (2009) High-Mg carbonatitic microinclusions in some Yakutian diamonds—a new type of diamond-forming fluid. Lithos 112, 648-659. Schrauder, M., Navon, O. (1994) Hydrous and carbonatitic mantle fluids in fibrous diamonds from Jwaneng, Botswana. Geochimica et Cosmochimica Acta 58, 761-771. Weiss, Y., McNeill, J., Pearson, D.G., Nowell, G.M., Ottley, C.J. (2015) Highly saline fluids from a subducting slab as the source for fluid-rich diamonds. Nature 524, 339. Izraeli, E.S., Harris, J.W., Navon, O. (2001) Brine inclusions in diamonds: a new upper mantle fluid. Earth and Planetary Science Letters 187, 323-332. Klein-BenDavid, O., Izraeli E.S., Hauri E., Navon, O. (2007) Fluid inclusions in diamonds from the Diavik mine, Canada and the evolution of diamond-forming fluids. Geochimica. Cosmochimica. Acta 71, 723–744. Tomlinson, E.L., Müller, W., EIMF (2009) A snapshot of mantle metasomatism: Trace element analysis of coexisting fluid (LA-ICP-MS) and silicate (SIMS) inclusions in fibrous diamonds. 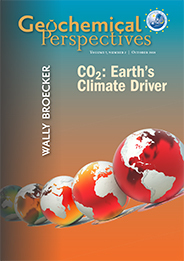 Earth and Planetary Science Letters 279, 362-372. Broadley, M.W., Ballentine, C.J., Chavrit, D., Dallai, L., Burgess, R. (2016) Sedimentary halogens and noble gases within Western Antarctic xenoliths: Implications of extensive volatile recycling to the sub continental lithospheric mantle. Geochimica et Cosmochimica Acta 176, 139-156. Spetsius, Z.V., Taylor, L.A., Valley, J.W., Deangelis, M.T., Spicuzza, M., Ivanov, A.S., Banzeruk, V.I. (2008) Diamondiferous xenoliths from crustal subduction: garnet oxygen isotopes from the Nyurbinskaya pipe, Yakutia. European Journal of Mineralogy 20, 375-385. ). We combine halogen and noble gases to explore the origin(s) of diamond-hosted fluids within the Siberian SCLM. Burgess, R., Layzelle, E., Turner, G., Harris, J.W. (2002) Constraints on the age and halogen composition of mantle fluids in Siberian coated diamonds. Earth and Planetary Science Letters 197, 193-203. ). Halogen concentrations are higher in cubic diamonds indicating that halogens are predominantly sited within microinclusions, given the greater proportion of inclusions in the cubic diamonds compared to the coated or cloudy samples. Burgess, R., Cartigny, P., Harrison, D., Hobson, E., Harris, J. (2009) Volatile composition of microinclusions in diamonds from the Panda kimberlite, Canada: Implications for chemical and isotopic heterogeneity in the mantle. Geochimica et Cosmochimica Acta 73, 1779-1794. Bureau, H., Keppler, H., Métrich, N. (2000) Volcanic degassing of bromine and iodine: experimental fluid/melt partitioning data and applications to stratospheric chemistry. Earth and Planetary Science Letters 183, 51-60. ). The I/Cl of Nyurbinskaya diamonds are also consistently mantle-like, suggesting fractionation during diamond formation is not the main mechanism controlling the increase in Br/Cl. To explain the relative enrichment in Br without an associated enrichment of I, is therefore more consistent with mixing between two distinct components (mantle-like + high Br/Cl component; Fig. 1). ). Whilst Nyurbinskaya and Canadian diamonds generally range from mantle values towards higher Br/Cl and I/Cl, some diamonds have I/Cl lower than the mantle, which could not be formed from the same fractionation process responsible for the elevated Br/Cl and I/Cl and may therefore signify a subducted AOC component in the parental fluids (Fig. 1). Mattey, D., Lowry, D., Macpherson, C. (1994) Oxygen isotope composition of mantle peridotite. Earth and Planetary Science Letters 128, 231-241. Gregory, R.T., Taylor, H.P. (1981) An oxygen isotope profile in a section of Cretaceous oceanic crust, Samail ophiolite, Oman: Evidence for δ18O buffering of the oceans by deep (>5 km) seawater-hydrothermal circulation at mid-ocean ridges. Journal of Geophysical Research 86, 2737-2755. ), suggesting the release of fluids from the upper oceanic crust, where low temperature alteration occurs, may be the potential source of the halogen-rich fluids within the Siberian SCLM. The subduction of AOC fluids can therefore provide a Br/Cl enriched source necessary to explain the signature of the Nyurbinskaya diamonds. An AOC Br/Cl and I/Cl origin could also account for some of the values measured within other fibrous diamonds (Fig. 1). The extreme Br/Cl and I/Cl measured in some Canadian diamonds cannot be accounted for by the simple addition of AOC-like fluids to the SCLM, suggesting that another process may be responsible for enriching diamond-forming fluids in Br and I relative to Cl. This process may be related to an unknown fractionation process during subduction or within the SCLM, however the processes driving further enrichment of Br and I remain unknown. Basu, A.R., Poreda, R.J., Renne, P.R., Teichmann, F., Vasiliev, Y.R., Sobolev, N.V., Turrin, B.D. (1995) High-3He plume origin and temporal-spatial evolution of the Siberian flood basalts. Science 269, 822-825. Gautheron, C., Moreira, M., Allègre, C. (2005) He, Ne and Ar composition of the European lithospheric mantle. Chemical Geology 217, 97-112. Barry, P.H., Hilton, D.R., Day, J.M., Pernet-Fisher, J.F., Howarth, G.H., Magna, T., Agashev, A.M., Pokhilenko, N.P., Pokhilenko, L.N., Taylor, L.A. (2015) Helium isotopic evidence for modification of the cratonic lithosphere during the Permo-Triassic Siberian flood basalt event. Lithos 216, 73-80. ), suggesting that the formation of kimberlites and fibrous diamonds in the Siberian Craton around 360 Ma may be linked to the injection of plume material. The He and Ne isotopic composition of Nyurbinskaya diamonds indicates that they contain a mixture of air and a mantle end member, the latter having high 3He/4He and mantle-like 20Ne/22Ne compositions similar to the Siberian Flood Basalts, with an additional contribution from the low 3He/4He SCLM (Fig. S-5). Taylor, W.R., Canil, D., Milledge, H.J. (1996) Kinetics of Ib to IaA nitrogen aggregation in diamond. Geochimica et Cosmochimica Acta 60, 4725-4733. ). Individual FTIR measurements on the coats of the fibrous samples show low degrees of N aggregation, indicating fibrous coats formed around the same time and resided at similar mantle temperatures, as the cubic diamonds. 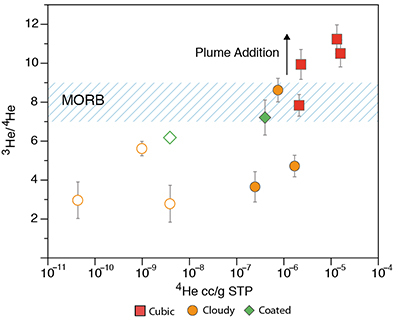 Cubic diamonds, which are most abundant in microinclusions and have very short mantle residence times, have the most plume-like noble gas signature suggesting that the fluids may be related to the influx of deep mantle volatiles triggering diamond growth. 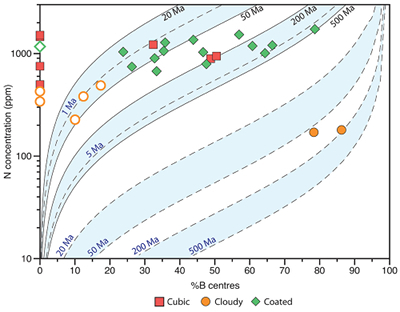 In contrast, the optically clearer diamond cores of the coated stones have a consistently larger percentage of nitrogen B centres suggesting a longer residence time as well as potentially acting as seeds for the growth of fibrous coats. It should be noted that given the temperature range estimated for the Siberian SCLM at the time of Nyurbinskaya kimberlite formation, all except some of the cloudy diamonds could have mantle residence as low as 5 Ma and therefore may be related to the same metasomatic event(s). Three cubic diamonds that have similar nitrogen contents and aggregation states as the coated diamonds may indicate that even the cubic diamonds retain older diamond cores (i.e. seeds), or that the higher temperatures associated with plume accelerated the nitrogen aggregation state over short time scales (Fig. 4). Sunagawa, I. (1984) Morphology of natural and synthetic diamond crystals. In: Sunagawa, I. (Ed.) Materials Science of the Earth's Interior. Terra Scientific Publishing Co., Tokyo, 303-330. Klein-BenDavid, O., Pearson, D.G., Nowell, G.M., Ottley, C., McNeill, J.C., Cartigny, P. (2010) Mixed fluid sources involved in diamond growth constrained by Sr–Nd–Pb–C–N isotopes and trace elements. Earth and Planetary Science Letters 289, 123-133. Stachel, T., Luth, R.W. (2015) Diamond formation—Where, when and how?. Lithos 220, 200-220. Skuzovatov, S.Y., Zedgenizov, D.A., Ragozin, A.L., Shatsky, V.S. (2012) Growth medium composition of coated diamonds from the Sytykanskaya kimberlite pipe (Yakutia). Russian Geology and Geophysics 53, 1197-1208. Zedgenizov, D.A., Harte, B., Shatsky, V.S., Politov, A.A., Rylov, G.M., Sobolev, N.V. (2006) Directional chemical variations in diamonds showing octahedral following cuboid growth. Contributions to Mineralogy and Petrology 151, 45-57. Jacob, D.E., Viljoen, K.S., Grassineau, N., Jagoutz, E. (2000) Remobilization in the cratonic lithosphere recorded in polycrystalline diamond. Science 289, 1182-1185.
) already present within the lithosphere, leading to the precipitation of fibrous diamonds, and fibrous coats around a previous generation of diamonds within the Siberian SCLM. This work was financially supported though a JSPS international research fellowship PE 14721 (to MWB) and JSPS KAKENHI grant numbers JP 26287139 and JP15KK0150 (to HS). The work of DAZ and ALR was supported by Russian science foundation (16-17-10067). RB acknowledges funding from the NERC (NE/M000427/1). SM acknowledges funding from the NERC (NE/PO12167/1). We also appreciate the constructive comments from Yaakov Weiss and an anonymous reviewer, which contributed greatly to our manuscript. 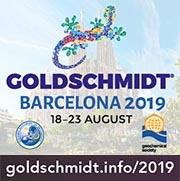 Some of the coated and cloudy diamonds have lower than SCLM 3He/4He suggesting the additional input of radiogenic 4He to the SCLM from a subducted component (Barry et al., 2015). The upper range of 3He/4He in the diamonds is similar to values obtained from Siberian Flood Basalts (<12.7; Basu et al., 1995) indicating that the diamonds contain at least two noble gas components; a low 3He/4He SCLM component and a high 3He/4He primitive mantle component, potentially related to the Siberian plume. The core of the coated diamonds however, show nitrogen aggregation states more consistent with a mantle residence age of between 1 Ma and 200 Ma based on a residence temperature of 1200-1300 °C, as estimated from mantle xenoliths in the nearby Udachnaya kimberlite (Boyd et al., 1997). Figure 4 [...] Isotherms are calculated assuming a temperature range between 1200 °C (solid lines) and 1300 °C (dashed lines) as reported for Udachnaya xenolith (Boyd et al., 1997) and assumed residence times between 1 Ma and 200 Ma. Halogens and noble gases are concentrated in surface reservoirs, and have distinguishable elemental/isotopic ratios within different reservoirs, making them sensitive tracers of subduction-related metasomatism (Broadley et al., 2016). The I/Cl ratio is expected to be fractionated to a greater degree given that halogen fractionation is most likely controlled by differences in solubility in the aqueous fluid, which increases from NaCl < NaBr < NaI, leading to the heavier halogens being concentrated in the brine fraction, relative to the lighter halogens (Bureau et al., 2000). The range of Cl (0.5-20.3 ppm), Br (2.7-168.6 ppb) and I (0.1-2.1 ppb) concentrations within the diamonds (n = 7; Table S-1) are higher than previously reported measurements of Siberian fibrous diamonds (Burgess et al., 2002). Nitrogen aggregation states of fibrous diamonds indicate they have short mantle residence times, and 40Ar-39Ar ages of fibrous coats suggests their growth is related to kimberlite magmatism (Taylor et al., 1996; Burgess et al., 2002). Fibrous diamonds often appear to be genetically linked to the last episode of metasomatism within the SCLM, possibly associated with kimberlite magmatism (Burgess et al., 2002), although there is evidence for the formation of fibrous diamond in older metasomatic events (Zedgenizov et al., 2006). Similar Br/Cl signatures have been previously measured in fibrous diamonds from Canada (Johnson et al., 2000; Burgess et al., 2009). The above mantle Br/Cl and I/Cl values in Canadian diamond-fluids were attributed to either the subduction of volatiles into the SCLM or fractionation of halogens during the separation of immiscible fluids (Burgess et al., 2009). The latter process was considered most feasible given the lack of a known subduction component with similar Br/Cl and I/Cl values (Burgess et al., 2009). 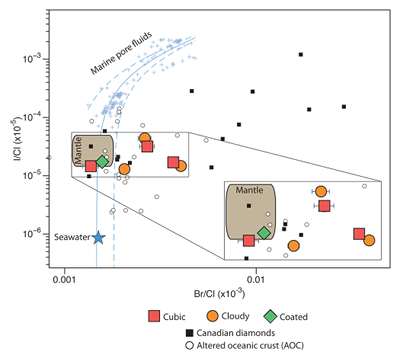 Figure 1 [...] Seawater, average mantle, marine pore fluids, altered oceanic crust fluids (AOC) and Canadian diamonds are shown for reference (Johnson et al., 2000; Muramatsu et al., 2007 and references therein; Kendrick et al., 2012; Chavrit et al., 2016). A potential high Br/Cl source is the fluid fraction trapped within altered oceanic crust (AOC) (Chavrit et al., 2016). High Br/Cl in AOC fluids is attributed to phase separation of saline fluids during seawater-basalt interaction, and/or the sequestering of Cl into alteration minerals (Chavrit et al., 2016). Higher than mantle I/Cl in AOC may indicate a limited degree of fractionation or the presence of an I-rich sedimentary component (Fig. 1; Chavrit et al., 2016). Notably, Br/Cl of AOC fluids decreases with depth in the oceanic crust (Chavrit et al., 2016), suggesting the release of fluids from the upper oceanic crust, where low temperature alteration occurs, may be the potential source of the halogen-rich fluids within the Siberian SCLM. The cubic diamonds therefore appear to be dominated by volatiles associated with the plume-like signature, whilst coated and cloudy diamonds retain more of the original lithospheric signature (4 - 6 RA; Gautheron et al., 2005). The 3He/4He signatures of the diamonds differ according to type, with the cubic diamonds having 3He/4He extending above the MORB range (8 ± 1 RA; Graham, 2002), whilst the coated and cloudy diamonds range from MORB-like to lower values. Elevated δ18O is interpreted as evidence for subduction of oceanic crust, which has undergone low temperature alteration (Gregory and Taylor, 1981). Diamond formation events within the sub-cratonic lithospheric mantle (SCLM) are related to metasomatism, often coeval with tectonothermal events, such as subduction and plume emplacement (Haggerty, 1999; Gurney et al., 2010). Saline fluids in diamonds have been shown to have high concentrations of Cl of up to ~40 wt. % (Izraeli et al., 2001; Klein-BenDavid et al., 2007). 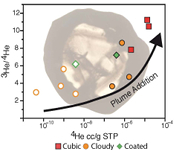 The input of plume mantle material to the Siberian SCLM (Sumino et al., 2006) may therefore have re-mobilised subducted halogen (this study) and carbon-rich material (Jacob et al., 2000) already present within the lithosphere, leading to the precipitation of fibrous diamonds, and fibrous coats around a previous generation of diamonds within the Siberian SCLM. Diamonds from Canadian kimberlites, previously shown to contain saline inclusions (Tomlinson et al., 2009) have highly elevated Br/Cl and I/Cl values, suggesting parental fluids may have been introduced to the SCLM during ancient subduction-related processes (Johnson et al., 2000). Fractionation should therefore result in a steeper profile of Br/Cl and I/Cl than that measured in the Nyurbinskaya and Canadian diamonds (Johnson et al., 2000). Fluids trapped in diamonds are categorised into four major compositional groups, distinguishable on a ternary plot for K + Na (saline), Al + Si (silicic), and Ca + Mg + Fe (high- and low-Mg carbonatitic) (Klein-BenDavid et al., 2009). The formation of fibrous diamonds in particular requires the precipitation of carbon from supersaturated fluids (Sunagawa, 1984), either during the progressive cooling of the C-O-H metasomatic fluids or from a change in the oxidation state where upon dissolved carbon can be precipitated as diamond (Klein-BenDavid et al., 2010). Mantle xenoliths from Nyurbinskaya show δ18O values up to +9.65 %o, higher than typical mantle samples (+5.5 %o; Mattey et al., 1994). These fluids can be trapped as microinclusions along the surfaces of diamond fibres and surrounding diamond-hosted mineral inclusions (Navon et al., 1988; Nimis et al., 2016; Skuzovatov et al., 2016). The four compositional end members are considered to form either via immiscible separation of hydrous and carbonatitic fluids within the SCLM (Schrauder and Navon, 1994), or via the interaction of a parental saline fluid with the lithosphere, producing silicic and carbonatitic fluids (Weiss et al., 2015). Carbon isotopes in the cores of fibrous diamonds from the Sytykanskaya kimberlite in Yukutia extend from mantle-like to light δ13C values (–3.8 to –19.7 ‰) indicating that the Siberian craton contains a subducted carbon component (Skuzovatov et al., 2012). The Nyurbinskaya kimberlite contains a higher proportion of eclogitic diamonds, relative to other Siberian kimberlites – potentially indicating the diamonds have a subduction-related origin (Spetsius et al., 2008). Cooling of C-O-H fluids as they interact with the surrounding lithosphere causes a decrease in the solubility of carbon leading to the supersaturation of the fluid and precipitation of diamond (Stachel and Luth, 2015). The neon isotope composition of Nyurbinskaya diamonds is similar to those from Udachanaya (Sumino et al., 2006), suggesting that the formation of kimberlites and fibrous diamonds in the Siberian Craton around 360 Ma may be linked to the injection of plume material. Figure 3 [...] Dashed black line is the trend for Udachnaya olivine xenocrysts (Sumino et al., 2006).